Marsupials were saved from competition with more highly developed mammals. Birds unique to Australia also survived, and distinctive trees and plants developed. There are about 280 species of mammals, 800 of bird, 300 of lizard, 140 of snake and two of crocodile. 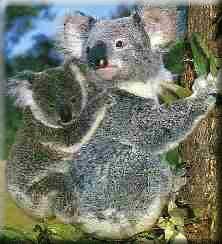 Of the mammals, almost half are marsupials. The rest are either placental mammals or monotremes and most are unique to Australia. Australia�s best-known animals are the kangaroo, koala, platypus, wombat and spiny anteater. Isolation enabled the Australian continent to become a sanctuary for marsupials - mammals that suckle their young in pouches. Among Australia�s marsupials are grazing animals, tree climbers, amphibians, earth burrowers, and the counterparts of cats and dogs and rats and mice. There are about 50 species of kangaroo, ranging from some that stand as tall as a man to others as small as cats. Pictured is a koala with her cub. Of the bird species listed in Australia, 400 - including the large, flightless emu - are found nowhere else. Isolation also allowed for the development of strange birds - as strange as the kangaroo and the koala. They range from tiny honeyeaters to the flightless emu which stands nearly two metres tall. There are 55 species of parrots in Australia, and the birds are as numerous as they are colourful. A map by one of the earliest navigators suggested the Australian continent should be called Terra psittacorum, land of parrots. Some of these birds are worth thousands of dollars a pair overseas, whereas in Australia they wake you up in the morning and crap on your car. Pictured are Rainbow Lorikeets. We have more species of venomous snakes than any other continent and our spiders are also among the world's most venomous. Australia has 20,000 species of plants, including living fossils such as the cycad palm and the grass tree, and brilliant wildflowers such as the waratah, Sturt�s desert pea, the flowering cones of banksia trees, and the red and green kangaroo paw. The continent has 700 species of acacia, which Australians call wattle, and 1,200 species in the Myrtaceae family which includes eucalypts or gum trees. Wildflowers turn the arid and savanna grassland areas of Australia into carpets of colour after rain. Native forests are limited mainly to wetter coastal districts and rainforests are mainly in Queensland. The subdued and sombre tones of the eucalypts give the face of Australia its distinctive appearance. Eucalypts truly occupy the continent, from the snow country of the south to the tropics of the north, salt-laden estuary banks and harsh deserts. Some species hug the ground while others reach towards the sky and specimens more than 150 metres in height have been recorded.